Here’s the thing about Rome: whether you’re spending 2 days in Rome or 2 weeks, you will 1) never run out of things to do, and 2) have plenty of time to see the highlights. While it’s true that Rome is chock full of enough things to do (and eat) that it can occupy a traveler for a lifetime, the city is actually a fairly simple one to get an overview of on a short trip. Its main attractions split very cleanly into a 2 day Rome itinerary, making it easy to see Rome’s most famous and incredible spots very quickly–even if you’ll do so by passing by approximately a million interesting sights along the way that will leave you dying to plan a return trip immediately. We are unapologetically obsessed with Rome, and it ranks among our favorite cities in the entire world. We’ve been to the city several times on visits ranging from a few days to a month each, and have made it our mission to get to know Rome better and better with each trip. Our goal with this 2 day Rome itinerary is quite simple: show you the best of the city–all of those highlights that are world-renowned and utterly unmissable during your first trip to Rome–and also help you fall in love with the city so much that you leave already planning to come back. Planning a short trip to Rome, particularly as a first timer to the city? We’ve got you covered with this 2 days in Rome itinerary. How Many Days in Rome? The Omnia Card and Roma Pass: Are They Worth It? First things first: you’ve come all this way to Rome, and you want to see its most iconic sight ASAP, right? After ducking into a bar (aka coffeeshop) for a traditional Italian breakfast of a cappuccino and a pastry, head directly to the Colosseum to soak in some incredible history! It’s impossible to get lost heading here–take the metro to the stop marked “Colosseum”, and it will practically smack you in the face as you walk out of the station. On a short trip to Rome, we would definitely recommend purchasing a tour in order to skip the line: on a longer trip, you may prefer to pocket the cash instead, but with only 2 days in Rome, time is of the essence! Shop inexpensive skip-the-line tickets to the Colosseum here! Make your way over to the Roman Forum. Right next door to the Colosseum sits the impressive Roman Forum! We were blown away by how big the forum was on our first trip–when strolling through the remains of the buildings and avenues, it is fun and surprisingly easy to imagine what it must have looked like in all of its glory during the height of the Roman Empire. 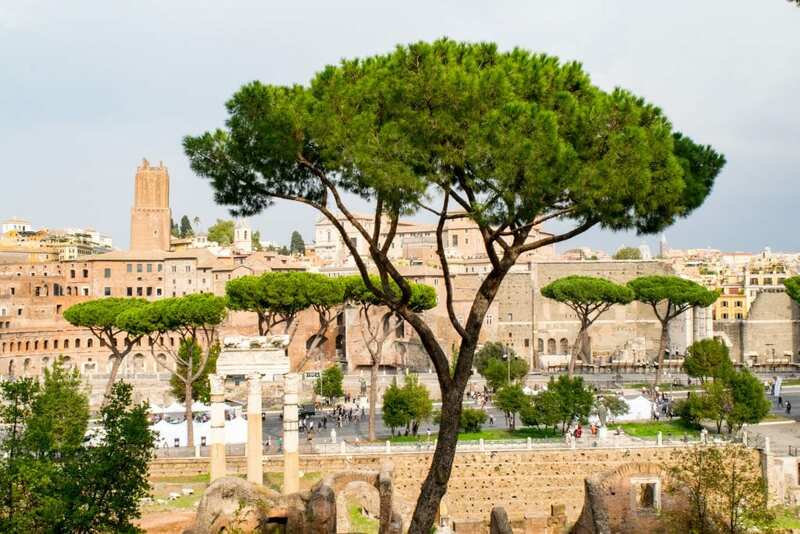 Within the complex of the Roman Forum sits Palatine Hill, where a short climb will reward you with even more ruins and incredible Roman history, but also gorgeous views of the Roman Forum, the Colosseum, and the city of Rome itself–including a view of St. Peter’s Basilica sitting in the distance. The climb is easy, short and well worth the time spent. Definitely don’t forget to bring your camera up there! After touring the Roman Forum and Palatine Hill both with a guide and without, we strongly believe that the context given by a guide is well worth the cost during your 2 days in Rome. 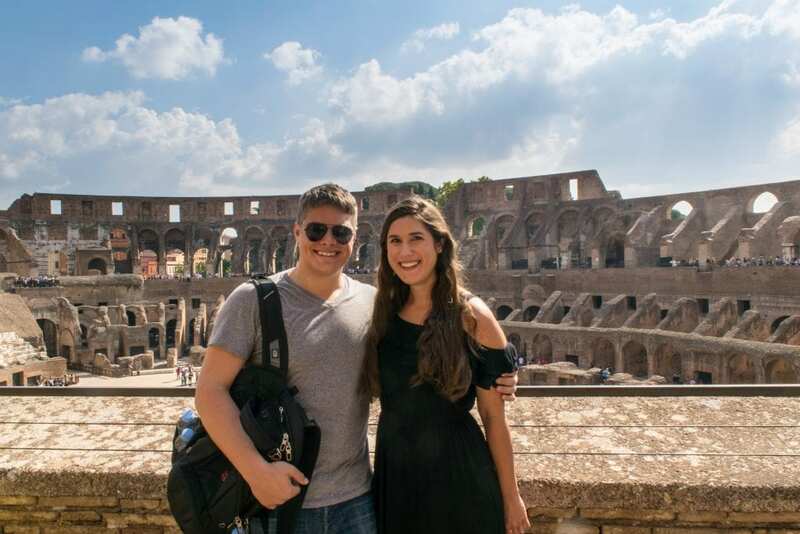 We used and loved this tour–and while the Colosseum guide was less necessary, having the Colosseum skip-the-line portion and tour included definitely helped justify the cost! 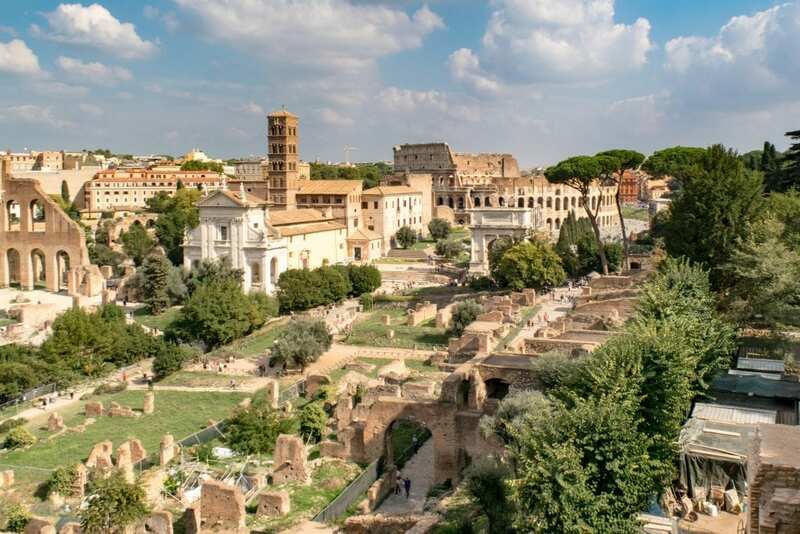 Book your guided tour of the Roman Forum & Palatine Hill! Why? So you’ll be guaranteed to see Rome again, of course. I’ll be honest: this fountain was incredibly high on my list of things I wanted to see on our first trip to Rome, beating out even more “worthy” historical sites. And… it was worth it. The architecture is just so incredible, and the brightly colored water is magnificently beautiful set against the white stone. We spent close to half an hour here, admiring the view, snapping photos, and tossing coins! Yes, we did share that lovely view with hundreds of our closest friends, but it was surprisingly easy to snag a prime location near the front to get up close and personal with the Trevi Fountain. If you’d prefer to avoid the crowds, consider rearranging your schedule to come here at dawn–we’ve managed to (almost) have the fountain all to ourselves then! 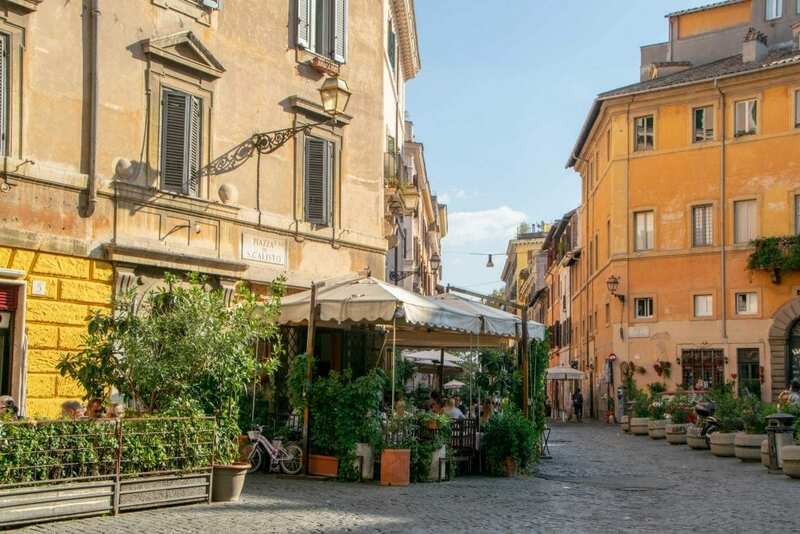 The walk to the Trevi Fountain takes about 25 minutes from Palatine Hill, but the walk is sightseeing within itself: enjoy the views of the lovely Roman architecture, bustling streets, and adorable cafes–this would be a great time to stop for lunch, too, if you’re getting hungry! Drop by the Galleria Sciarra. This small courtyard is not only absolutely beautiful, it’s an easy way to sneak a less-touristed spot into your 2 day Rome itinerary, because it is just down the street from the Trevi Fountain! The Galleria Sciarra is free to enter during business hours (the building itself is used for offices today), but the Art Nouveau frescoes painted by Giuseppe Cellini in the late 19th century that adorn the walls are an excellent example of how beauty and exceptional artwork is truly around every corner in Rome. The frescoes have a specific theme: women, or even more specifically, female virtues. 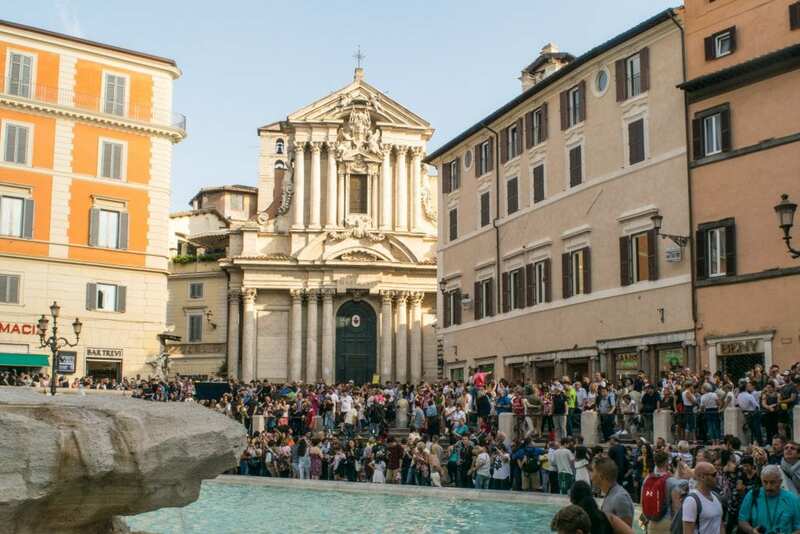 Feel free to take a moment to admire them for yourself–the courtyard will probably feel incredibly quiet and peaceful after the hectic crowds at the Trevi Fountain! Stroll to the Spanish Steps. These steps straddle two gorgeous Roman piazzas: Piazza di Spagna at the base and Piazza Trinita dei Monti at the top. Take a seat, enjoy the view, and take some time for people watching–after all the walking and touring earlier in the day, you’ve earned it. 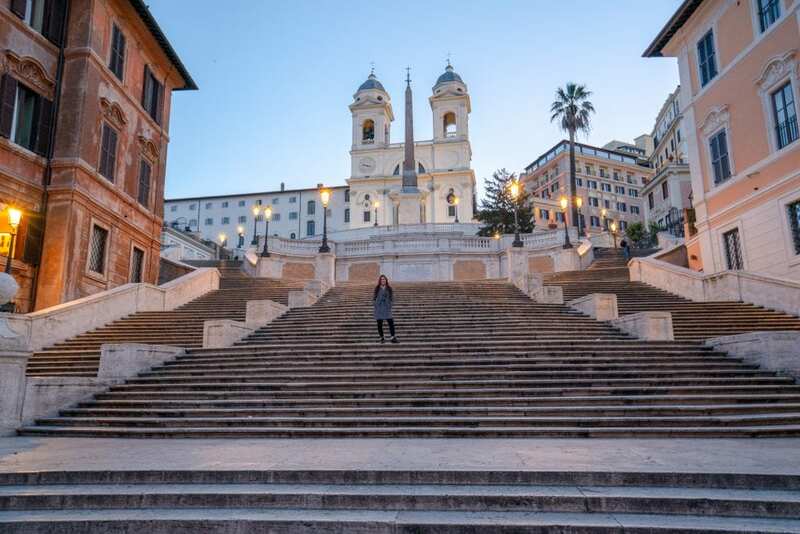 While visiting the Spanish Steps is fun at any time of day, bear in mind that it is frequently crowded–we got up at dawn in February to get this photo of the steps when they’re empty, so if you’re following this 2 day Rome itinerary, be prepared to share the view with a crowd! Make your way to the Piazza del Popolo. 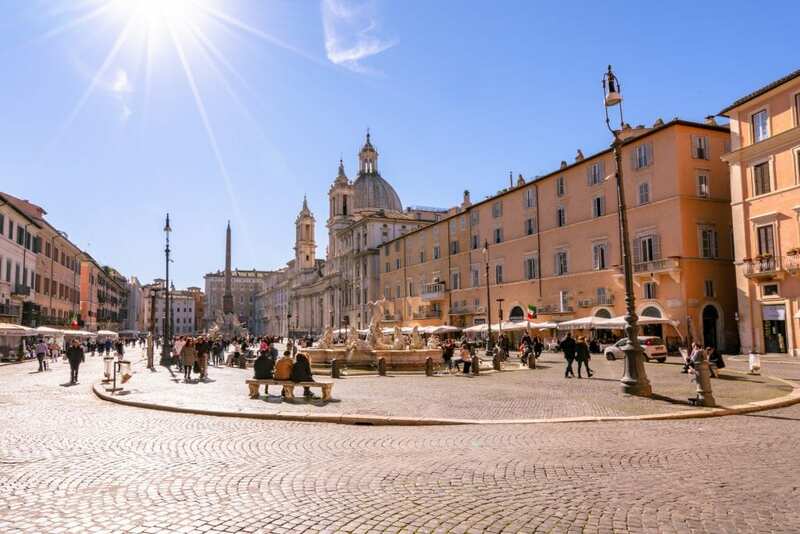 Walking from the Spanish Steps to the Piazza del Popolo is a lovely stroll in its own right, but even if it wasn’t, the destination would be worth it–Piazza del Popolo is easily one of the prettiest piazzas in Rome! 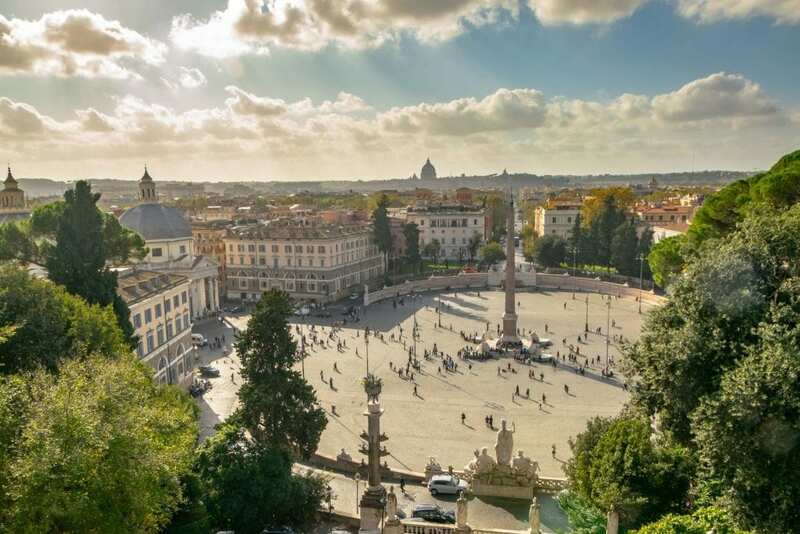 Be sure to climb up to the Pincio Terrace while you’re there for a beautiful view of Piazza del Popolo and of Rome itself from above. Optional: visit the Galleria Borghese. Whether or not you add on the Galleria Borghese to your 2 days in Rome itinerary is entirely a matter of travel style: if you’re a more laid-back traveler who’s not particularly into art, you’ll probably be ready to relax after hitting the Piazza del Popolo (especially considering there’s plenty of stunning art in the Vatican Museums coming up on your second day in Rome). If, however, you want to squeeze in every bit of sightseeing you can while in Rome and are an art buff, visiting one of the premier art collections in Italy is probably an unmissable experience. 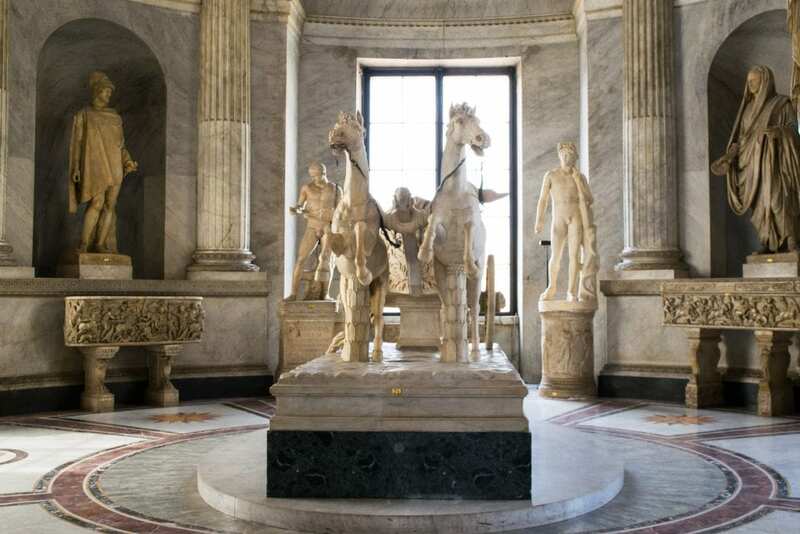 If you do decide to visit the Galleria Borghese as part of your 2 days in Rome, be sure to buy your tickets ahead of time to skip the line–especially during the popular summer months, lines can get very long here. Reserve your tickets for the Galleria Borghese today! 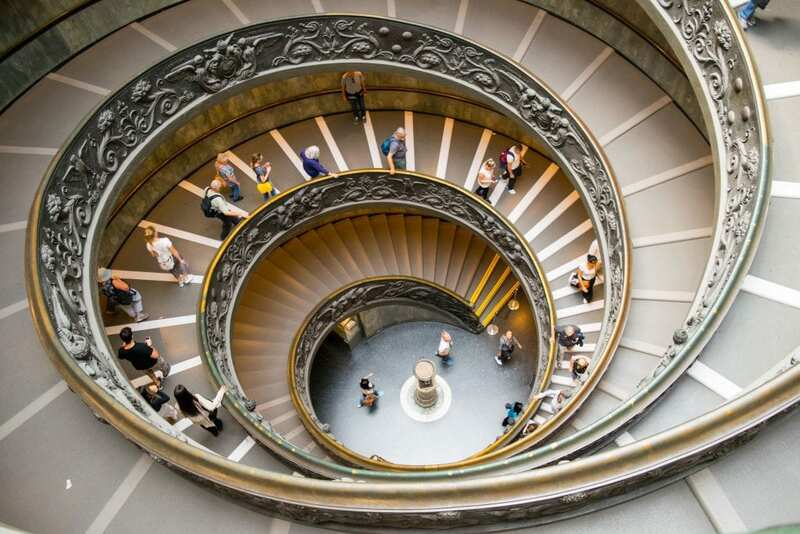 Head straight to the Vatican Museums. Magnificent sculptures, historic globes, some of the most beautiful maps in the world, endless paintings, a chance to visit an entirely new country without traveling outside of Rome, and–of course–the Sistine Chapel. No 2 day Rome itinerary could be complete without including a visit to Vatican City and the famed Vatican Museums! Like the Colosseum the day before, the Vatican Museums are something that you’re going to want to buy tickets for in advance: the lines are almost always ridiculously long, and with only a couple days in Rome, you absolutely want to avoid waiting in them. That being said, the museums are incredibly memorable, and we are so glad we braved the crowds in order to tour them. While we personally visited the museums during the day, if you’re particularly interested in seeing the Sistine Chapel without a few hundred of your new closest friends, we’ve had friends of ours absolutely rave about the experience of the first-entry tickets, where you can gain access to the museums and Sistine Chapel before they officially open for the day. While it is a slightly pricier option, word on the street is that if it’s in your budget, it’s 100% worth both the money and the effort spent getting out of bed early in the morning. Also, bear in mind when planning your 2 day Rome itinerary that the Vatican Museums are closed on Sundays, with the exception of the last Sunday of the month, when the museums are open and free to visitors who are able to enter before 12:30pm (they then close at 2:00pm). On your way out of the museums, be sure to stop by the Vatican City post office to send something to yourself from the smallest country in the world if that’s something you’re interested in! There’s also a cafe in the museums, and while we didn’t eat there, the prices looked reasonable–if you worked your way through the museums at a slower pace and are starving at this point, consider stopping for a snack or lunch. 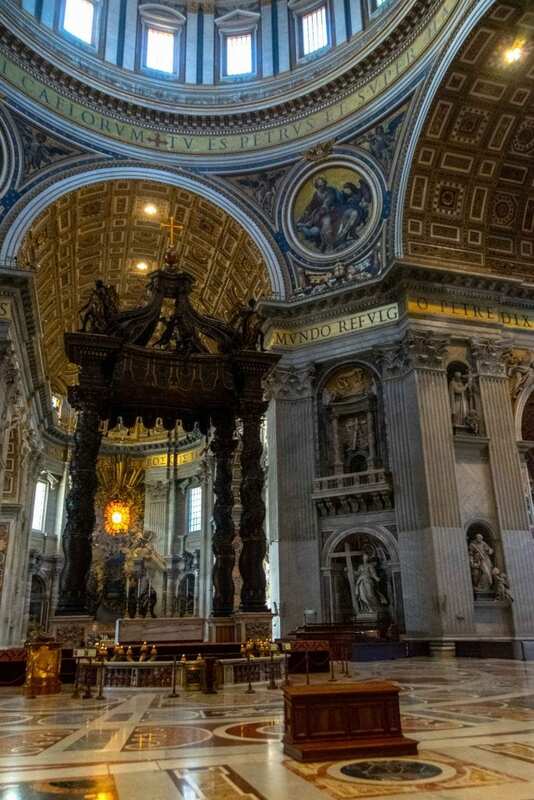 Shop inexpensive skip-the-line passes and tours for the Vatican Museums & Sistine Chapel here! Want to avoid the crowds entirely? Use first-entry tickets! Exit toward St. Peter’s Square. The first thing that struck us about St. Peter’s Square was simply how big it was: it put the footage of Pope Francis’ inauguration, for example, in a whole new light. Feel free to wander around the square, and when you’re ready, jump into line to head into the Basilica itself–it’s easily the most stunning one we have seen in Italy, and you definitely shouldn’t skip it during your 2 days in Rome (the line moves faster than you think). The Basilica is free to enter, but there is a small charge for climbing up to the top of the dome (which, unless you get very claustrophobic or don’t think you can handle the climb, we highly recommend. Keep in mind that St. Peter’s Basilica has a dress code that is enforced, so cover your shoulders and knees before entering! If you’re interested in seeing the Pope, public addresses are given most Wednesday mornings when he is in town. Tickets are required, but supposed to be fairly easy to get–be sure to plan this one in advance! Make your way to Castel Sant’Angelo. Castel Sant’Angelo, despite its name, was never built to be a castle at all, but a mausoleum. As the tomb of Emperor Hadrian and some of his family, Castel Sant’Angelo (in its original form, anyway), is an impressive nearly 2,000 years old–and it, combined with the Ponte (bridge) Sant’Angelo that sits in front of it, are absolutely worth seeing while in Rome. Whether or not you choose to duck inside the castle as part of your 2 days in Rome, be sure to enjoy the views of the Tiber River from in front of it, and to cross the Ponte Sant’Angelo–which will lead you directly into Centro Storico, one of Rome’s prettiest neighborhoods and the sight of the rest of this 2 days in Rome itinerary. Pay a visit to the Campo de’Fiori. This market square may be touristic, but it’s also beautiful, bustling, and worth stopping by during your 2 days in Rome. 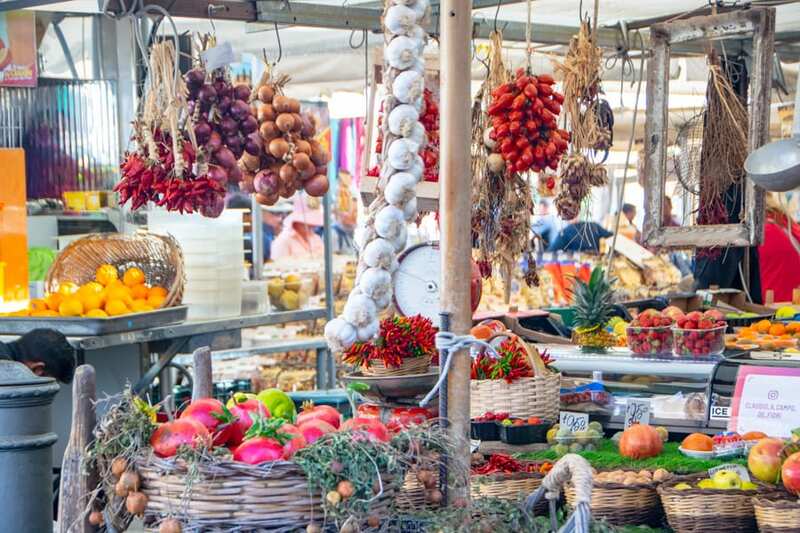 Markets are some of our favorite aspects of any city trip, and no trip to Rome could be considered complete without one. Of course, if you choose to purchase any foodie souvenirs or a meal at the market, you will pay a slight upcharge–but if you’re hungry, we did have tasty, if somewhat overpriced, pasta carbonara at (where else?) La Carbonara on the edge of the Campo de’Fiori. 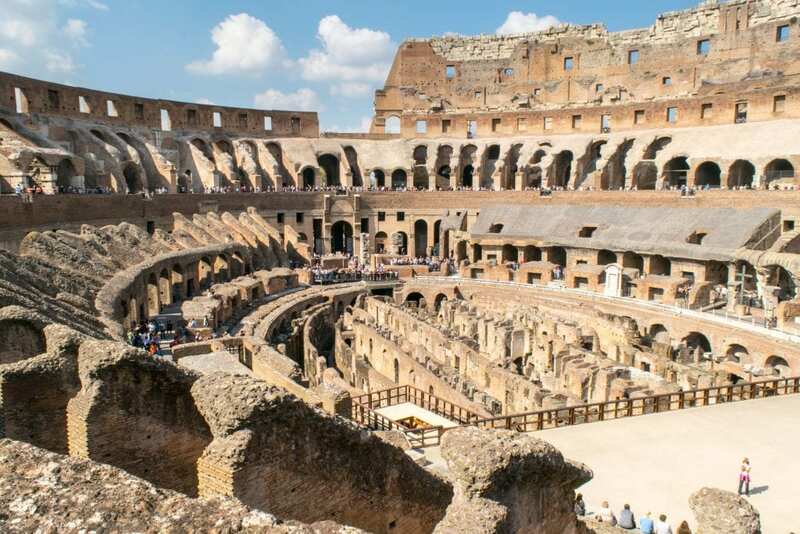 Once upon a time 2,000 years ago, the Romans built a stadium named Circus Domitianus. Over time, the stadium was torn down, the area paved, Baroque fountains were put in, markets gathered, Popes ordained summer splash pools… and eventually, out all of this activity and change, the area eventually became what is now known as Piazza Navona, and remains one of the best known and most popular piazzas in Rome to this day. It is a must-see during your 2 days in Rome itinerary–perhaps with a gelato in hand. 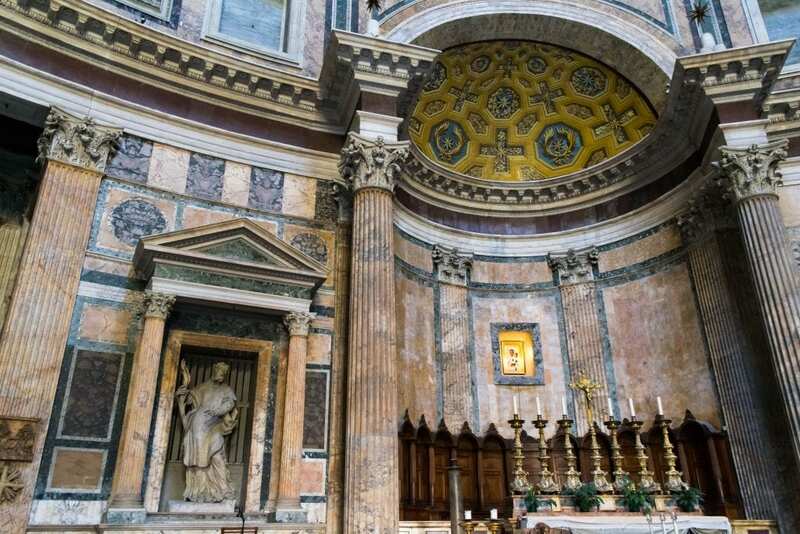 Ah, the mysterious Pantheon: a Roman-temple-turned-church, the famous Pantheon is home to many mysteries, such as exactly how old it is and what it is made out of! Even with the omnipresent crowds, we loved wandering around and gawking at the elaborate and gorgeous Pantheon. Unlike many places in Rome, this one is free to enter, so no need to open your wallet! 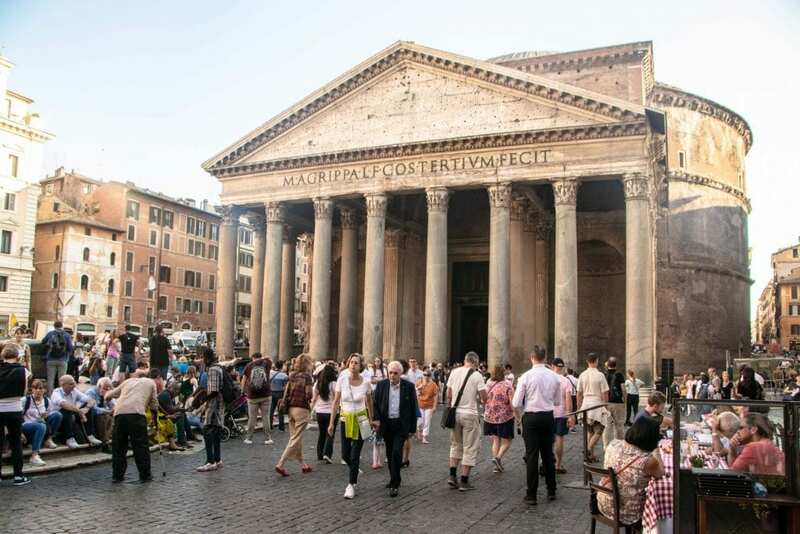 Right outside the Pantheon sits the beautiful Piazza della Rotonda–while you’re there, be sure to take a few moments to admire the view of the Pantheon from the piazza and the piazza itself. Still have a bit of energy? 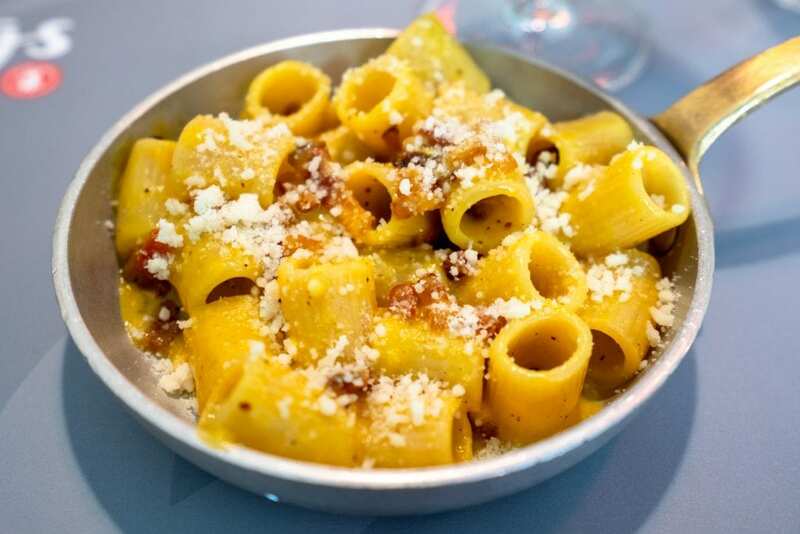 Finish your Rome trip with a food tour! Not completely wiped out from a full 48 hours of exploring Rome? If you still have some energy left, we recommend finishing your trip with a food tour: not only is this a fantastic way to taste a lot of the best dishes in Rome quickly (let’s face it: 2 days in Rome just isn’t enough time to work through all the dishes you likely want to try in the city), it’s a relaxing and fun way to see another neighborhood in Rome. We took this food tour through Trastevere (which has an evening schedule option) and adored it–the food was delicious and focused around traditional Roman dishes, our guide Ricardo was incredibly fun and knew the neighborhood well, and taking the tour gave us a chance to explore some new, beautiful streets of Trastevere that we hadn’t had a chance to discover ourselves yet. This tour does sometimes sell out, especially during the summer, so book a couple days in advance if you can! 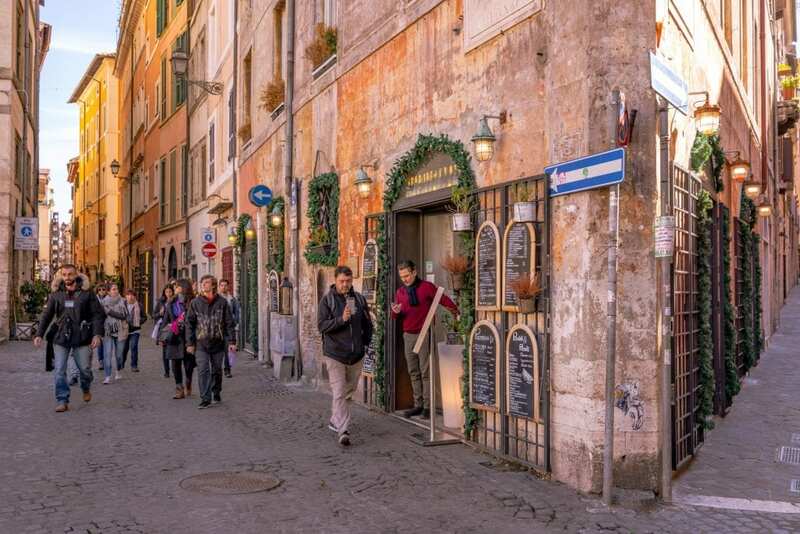 Trastevere is one of the most beautiful neighborhoods in Rome, complete without colorful buildings and cobblestone streets, and hasn’t been covered in the rest of this Rome itinerary–so even if you’re not the food tour type, we definitely recommend heading to Trastevere for dinner on your last night in Rome! 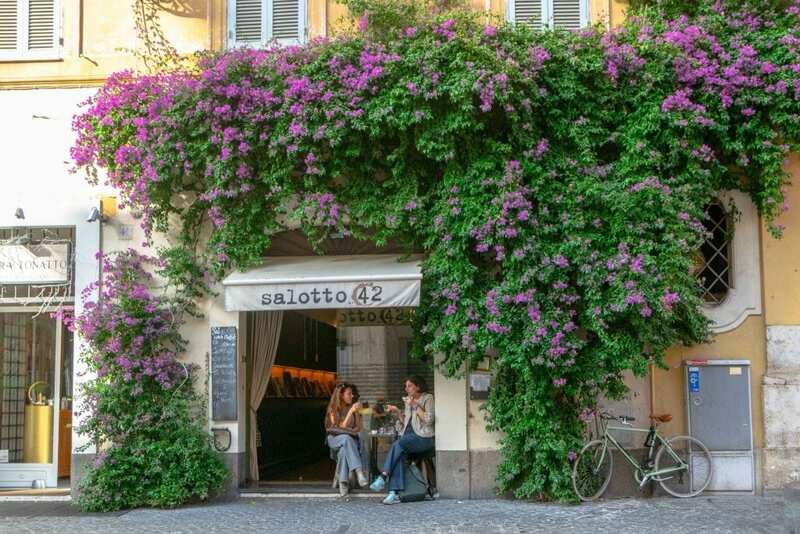 Book your Trastevere food tour today! We designed this 2 days in Rome itinerary to be as walkable as possible, grouping destinations by geography where we could. Even still, Rome is large enough that you will need to use other methods of getting around, especially if you don’t stay right in Centro Storico. 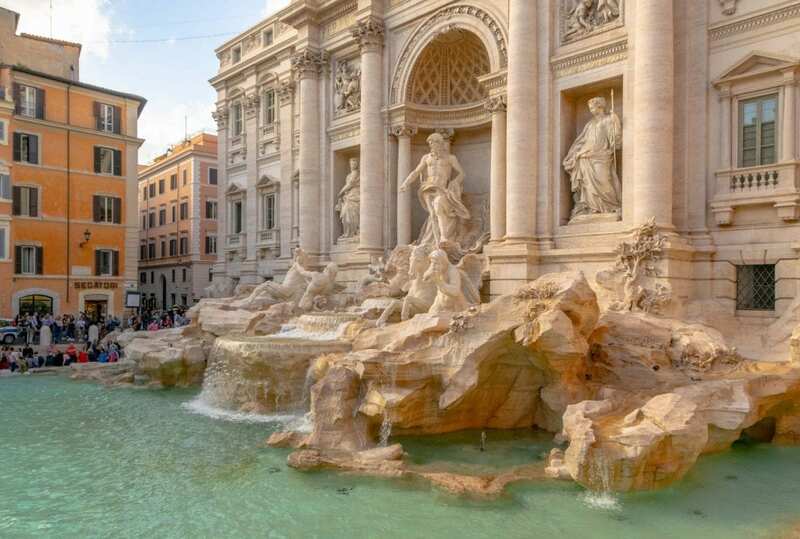 The easiest option is simply to use the metro–though Rome’s metro has a mere 3 lines (only 2 of which will likely be of interest to you as a visitor), it connects directly to many of the city’s highlights, including the Colosseum, Trevi Fountain, Spanish Steps, and more. 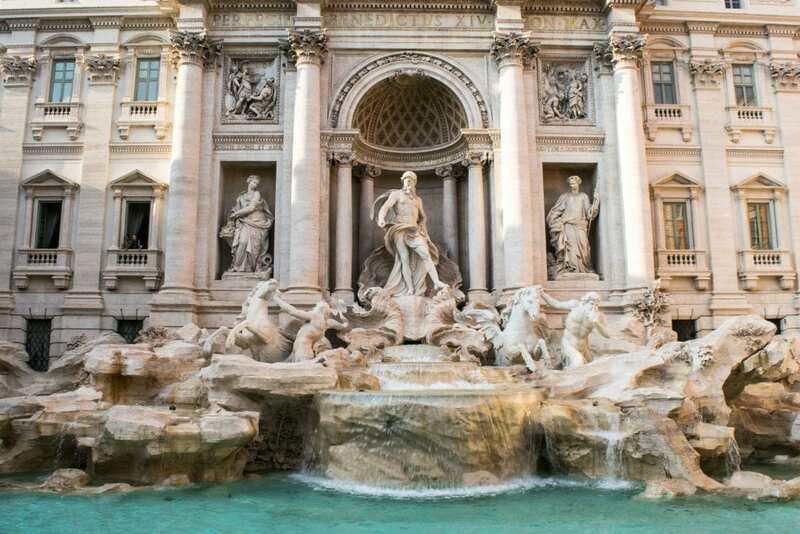 If you can swing it, your 2 days in Rome will be highly enhanced by staying within a short walk of a metro stop, or by staying in the Centro Storico neighborhood where you will be within walking distance of highlights like the Trevi Fountain, Spanish Steps, Pantheon, and more. Rome’s bus system is also an option, though it can be slightly confusing and you cannot purchase tickets onboard. Pick them up at a nearby bar or metro stop before hopping on, or aim for simplicity and purchase a multi-day pass to the transport network. Taxis are present in Rome, but Rome’s heavy traffic and their high prices make these options best avoided if possible when traveling between these more popular (and therefore congested) sights in Rome. For the same reason, we don’t generally recommend Hop On/Hop Off bus tours in Rome. 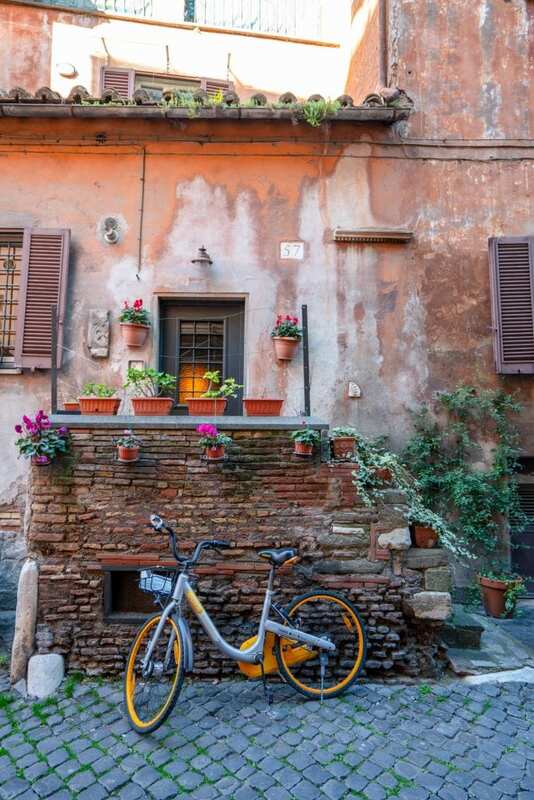 If you are planning on getting off the beaten path in Rome or you are staying somewhere not well-connected to public transportation, we like and use the MyTaxi app in Rome–think of it as a local Uber option. Uber is in a battle for legitimacy in Italy, and though it does have a presence in Milan, it is quite pricey and not particularly prevalent. For a full Italy trip that is covering multiple Italian cities in a short time (2 weeks or less), we believe 2 days in Rome is the perfect amount–it’s enough to hit all of the major highlights with plenty of time in your schedule leftover for leisurely meals, randomly wandering down streets, or adding in another couple of highlights if you’re the sightseeing-from-dawn-to-dusk type! Since most Italy trips will include stops in multiple cities–on a first trip, that would likely be Florence, Venice, and maybe Milan–there’s no need to overwhelm yourself in any one place. However, if you have time to kill, of course there are endless things to do in Rome. If you have more than 2 days in Rome (or just want to pack your itinerary as full as it can be), consider adding on a visit to the Galleria Borghese for some incredible art, a visit to the catacombs for some very interesting history, or a trip out to the Appian Way to combine a history lesson with some time in a beautiful park! And, of course, if visiting churches in Rome is your thing, you can essentially throw a stone anywhere in Rome and hit a very impressive one. Like most travelers to Rome, on our first visit to Rome, we compared the very expensive Omnia Card and not-as-expensive Roma Pass, and ended up buying… neither. While city passes can be a great deal in some destinations, we ultimately found both of these overpriced for what you get in return, and we weren’t interested in some of the benefits offered (like a hop on/hop off bus tour). That being said, it may be the right fit for some travelers–if you’re considering purchasing either the Omnia Card or Roma Pass, we recommend reading this article to get a clear understanding of the similarities and differences. Ultimately, there is no bad time to visit Rome–except perhaps July and August, if you are trying to avoid the heat! 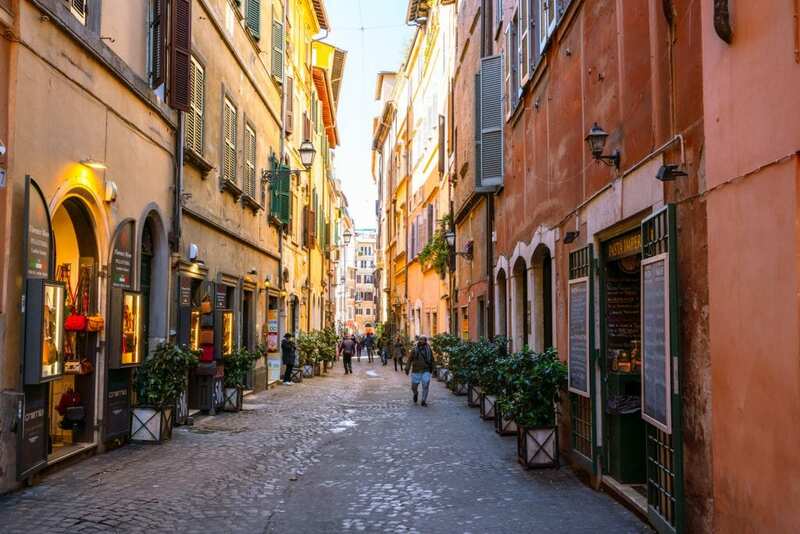 After multiple visits, our favorite time to visit Rome is in the spring or fall–shoulder season is the perfect season in Rome as far as we’re concerned. With only 2 days in Rome, you may want to stick to months like September or October as opposed to the riskier months like December, when the chance of rain soars. If you’d like the lowest prices and smallest crowds, consider a winter trip to Rome in January or February–after Christmas, before Easter, and during the dead of winter will ensure you have Rome as much to yourself as you’ll ever be able to. Don’t forget to include these important items when you pack for Rome! Travel Insurance — We don’t ever suggest traveling without travel insurance–anything can happen, and this is definitely a case of better safe than sorry. We use and recommend World Nomads for visiting Rome. Pacsafe — We can’t recommend our Pacsafe enough: this travel safe is affordable, sturdy, easy to pack, and will help keep your valuables safe in your hotel room (not that you should need to worry much about theft when visiting Rome, but better safe than sorry!). Travel Adaptors for Italy — If you’re coming from outside of Europe, you’ll definitely need adaptors for your electronics. Swiss Army Knife — Want to open wine bottles in your hotel room, slice cheese from the market, or cut up that focaccia from the bakery? You’ll be so glad you brought along a Swiss Army Knife! Umbrella — Option A: Plan on buying an umbrella when it starts pouring down rain. Option B: Plan ahead and buy a (probably much sturdier) umbrella before leaving. Option C: Hope you get lucky with the weather (but fair warning, we’ve never been to Italy and avoided rain entirely!). We loved our time at La Cornice Guesthouse (and its reasonable cost in notoriously pricey Rome), and we would definitely stay here again. I’ve been really interested in visiting Rome ever since the movie Angels and Demons came out, if I’m completely honest. And thanks for the heads-up on the metro passes. I always assumed that purchasing a day pass or even a week pass was beneficial and helped as a buffer, just in case I get on the wrong train or bus. I guess it’s probably best to do some price comparison beforehand. Price comparison is definitely the way to go, and every city is different–in Budapest, for example, we purchased week-long passes for far less than buying individual tickets. Best to take a few minutes to run the numbers before buying! Oh, I am so enjoying this! I visited Rome several times now and somehow, I get to the same places, each time. I am with you that 2 days in Rome is enough for starters, but my local friends keep insisting that there are so many places to see. I hope you enjoyed your 2 days 🙂 🙂 Have safe travels ahead! Ha, I know what you mean–I’d definitely want to discover more places if we go back (we actually spent almost a week in Rome this fall), but there’s no way I’m going back to Rome and skipping a second visit to some of the highlights! Your post on Rome just remind me of how much I missed out the TWO times I have been there! I didn’t visit the Vatican museum or the Spanish steps for exemples! I was just more people watching. And the second time I didnt even bother to throw a couple of coind in the Trevi fountain so I might not even get a third visit to Rome! Oh, I bet you’ll make it back that third time! I know what you mean–personally, we’re kicking ourselves for not climbing to the top of St. Peter’s Basilica for the view. All the more reason to go back! Rome is incredibly beautiful; as if I didn’t want to visit it enough, you have convinced me even more. It is good to know that some of these top attractions are located nearby. It saves you time from commuting to one attraction to another. And of course, it’s always nice to see a lot of attractions in a short amount of time. Given the hefty amount of historic attractions in Rome, you’ll want to squeeze in as many of those as possible! Structuring days around geography is definitely a huge help in a city of this size! It’s one of the first things we check for when planning our own itineraries. Wow I can never get tired of reading and looking at photo’s of Rome what a magnificent place. Those Spanish steps is where I would love to visit. I have read though that it is a busy city and can get quiet congested but it does not look to bad in your pics for that time of year. I would need a week though, 2 days would never be enough for me. Thanks for all the great info, happy travels you two! It definitely is magnificent! 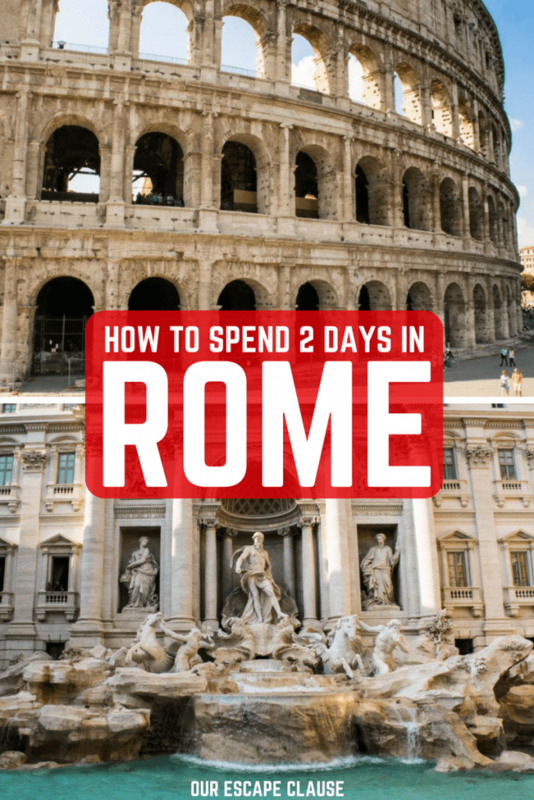 Two days definitely isn’t enough to master Rome (we spent almost a week and barely scratched the surface), but for a shorter Italy trip… honestly, as much as we loved Rome, I think we’d probably spend the extra days in a different part of Italy! I have just finished reading a book on Roman Empire. It fuelled my desire to learn more about Rome. Colosseum of course is on the top of my bucket list. I would love to discover the other ancient ruins of Rome as well. Vatican Museums also sound interesting. Ooooh, what book? One thing I’m trying to do more of in 2018 is to read books set in the places I’m traveling to–hoping to write some posts about that for certain destinations! I totally would pay a bit extra to pre-book tickets to the Colosseum and skip the line. Absolutely agree…time is of the essence when you only have 2 days! Good to know that 2 days is a sufficient amount of time to see all the key highlights of Rome. I would definitely love to spend 2 weeks in Italy, but traveling all through the country. Ha, funny you should mention that, Soraya… our next post will be a 2 week itinerary for Italy! 😉 I agree, it would be such a shame to come all the way to Italy and only see one city, no matter how amazing it is. Latin America is an incredible place, but yes–Rome totally deserves a return visit! I definitely thought about my school days while there, and I suspect Athens will have a similar effect when we (finally) get there. I went to Rome in winters with some snow. Your 2 days itinerary has covered all important and famous places of Rome. Colosseum and Trevi fountain are the first thing to visit in Rome. Vatican museum is also interested but due to lack of time I missed it and only saw Vatican city’s main hall with Pope’s address. If I visit rome next time, then I would surely go for Galleria Borghese as you have recommended it as a place for art and I love art. Rome must have been so beautiful in the snow! Too cold for my tastes, but I’m sure it was gorgeous. Hope you get to see the Vatican museums and Galleria Borghese next time! We will be going to Italy for two weeks Sept 5-18, what kind of weather/temps should we expect do you think? We will start in the Lake District, the Venice, Montecatini, Naples, then Rome. That’s an interesting time of year, as it can vary quite a bit depending on year–I’d pay close attention as your trip starts getting closer! In general, I would expect the Lake District to potentially be cool by then, but Naples and Rome should still be very warm. Every year is different, though! This itinerary looks great! I will have two full days in Rome this May. Your itinerary hits all the places that I want to go, plus some I didn’t know about. Thanks for the help and saving me some extensive planning. Now I just need to get my advance tickets for the Vatican! Thanks so much, Kelsey! I hope you have an absolutely amazing time in Rome!! Enjoyed your Rome itinerary and your photos. Like your sunrise shot of the Spanish Steps in particular. It’s not easy to get a photo that isn’t covered in tourists. We overlooked the Galleria Sciarra on our previous visits to Rome and will have to fit that in next time, as well. Nice find! It definitely isn’t! We needed the combination of a winter morning and jetlag to pull that one off, lol. Thanks so much! 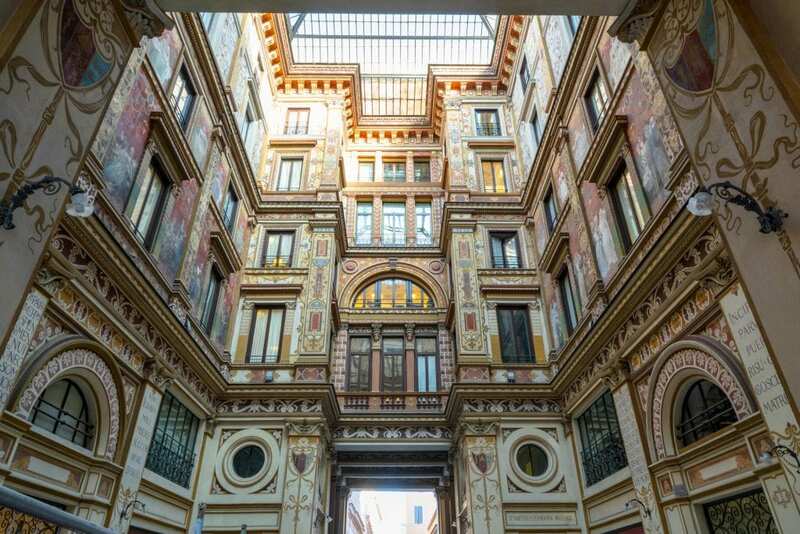 Enjoy the Galleria Sciarra–it is lovely.